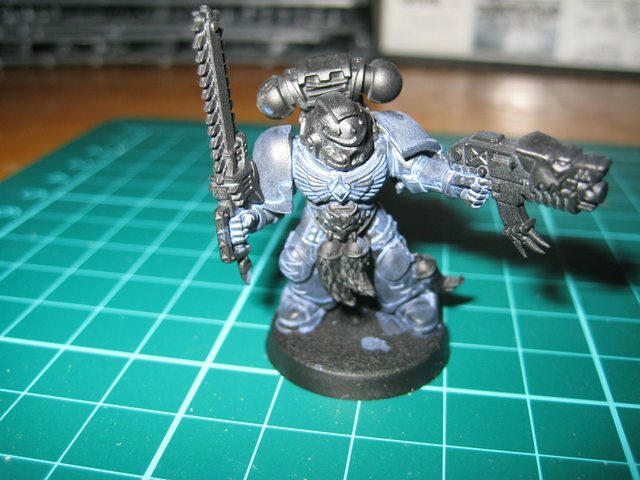 It’s been a while since I bought my first box of Space Wolves and with Hammerfest coming soon thought I’d pull my finger out and at least get the Grey Hunters I had already started – finished. Maybe then I could have a hope of fielding a tabletop quality army! 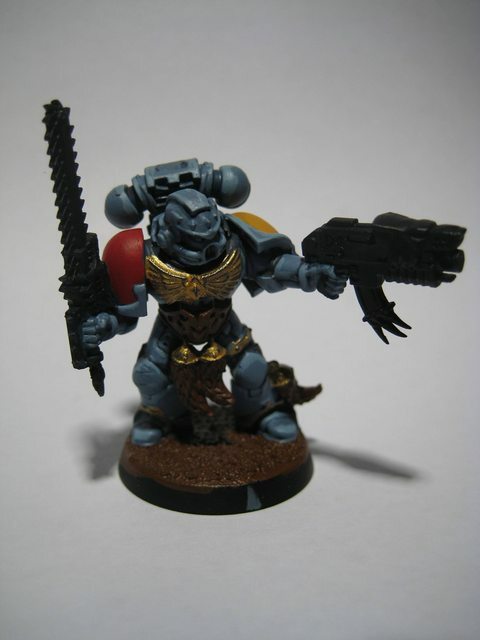 As it has been a bit of (re)learning experience getting back into the hobby and trying to catch up on the new ways of doing things (thinning down paints, wet pallettes, proper brushes, brush cleaners, etc. – I guess those things were around before, but in pre Internet days my gaming group were a sheltered bunch!) 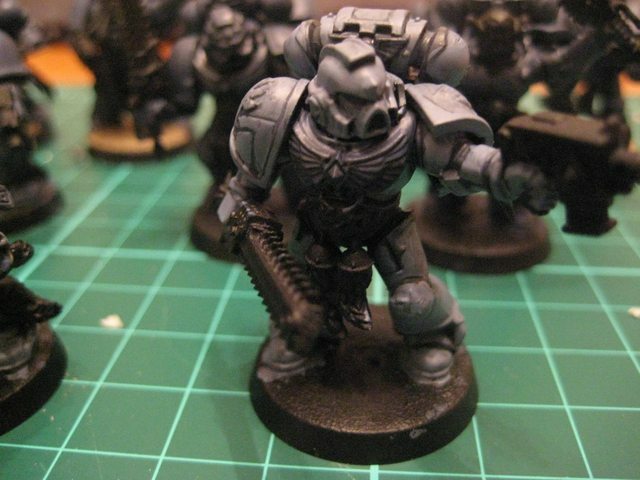 I have been taking some photos of each stage of painting my Grey Hunters as I went along. This has helped highlight where I have gone wrong and will hopefully speed up the process for the next batch of Greys & mean they will be better than the last. 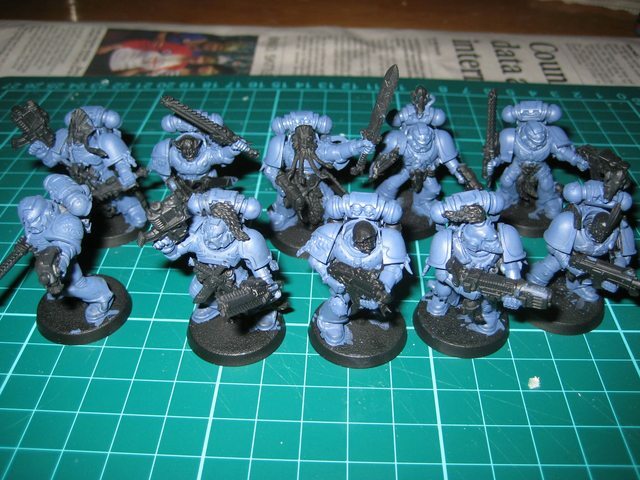 At his point I re-applied the basecoat colour to some of the raised areas and was starting to see some nice results. I plowed on and added the next layer colour (Russ Grey). To begin with, the colour contrast seemed too great as my eyes had got used to the darker grey (which a lot of people online seem to favour). 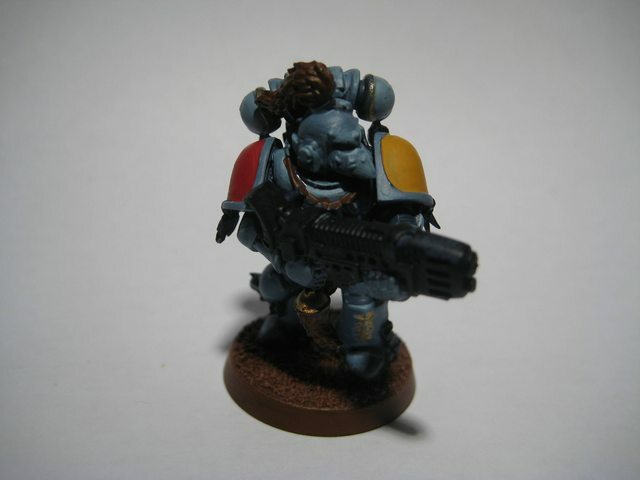 But I had decided I was after the more vanilla White Dwarf look and after a while got used to the lighter grey. By now I had already applied several layers of paint, just to cover the black spray paint and fix mistakes, so it was starting to get that ‘caked on’ look. 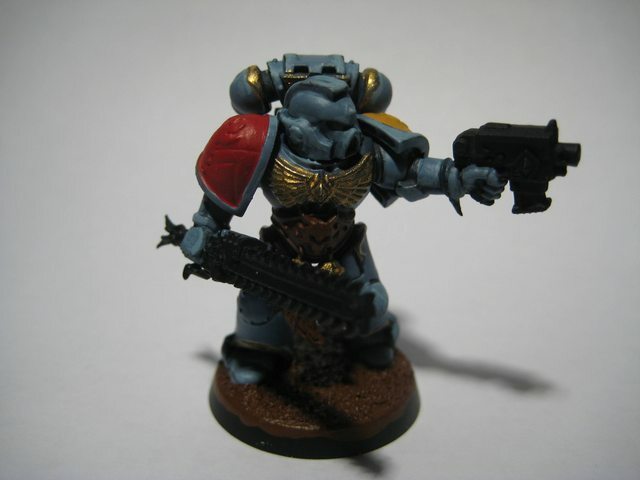 I figured I would cut my losses and just finish off the models, maybe returning one day (hopefully when my skills have improved!) to strip the paint and start again. 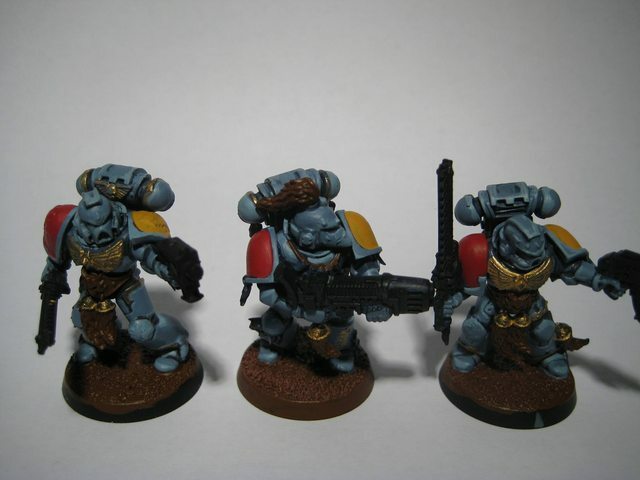 Obviously I still have some finishing off to do: going to wash the golds and highlight with silver (for that weathered look), drybrush the furs, paint the faces, highlight the belts and pouches, paint the guns, sort out the lenses, tidy up the shoulder pads & armour edge highlights and of course finish the bases. There is also room for improvement on picture front! 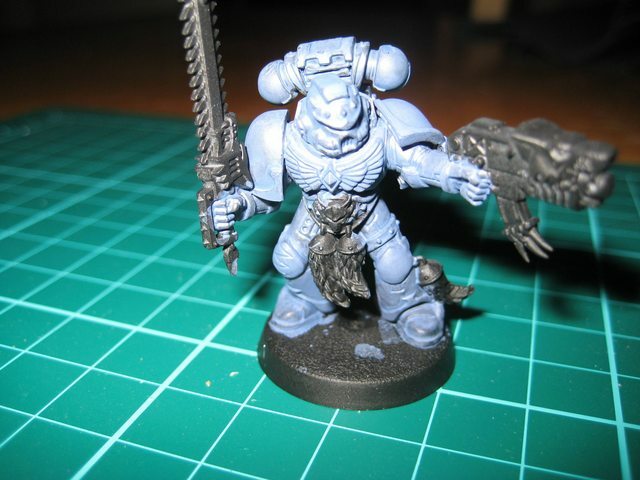 I think I’ll leave the shoulder pads for later – hopefully it should be good enough for tabletop quality at Hammerfest. Next time round I don’t think I’ll thin down the first basecoat so much that I have to apply it 2-3 times; then after the wash go straight to the mid layer (Russ Grey), so that the paint isn’t so thick. 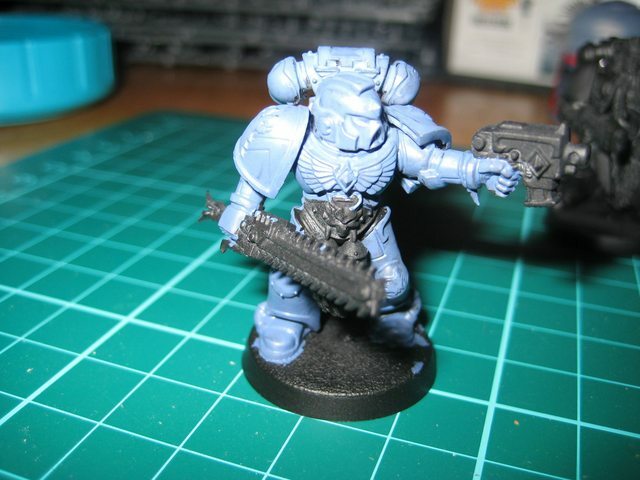 That way it’ll leave more room to blend in some of the other highlight colours recommended (Fenrisian Grey / Etherium Blue). Just another 10 or so of these Grey Hunters to do plus 2 HQ’s…given it’s taken me 3 months’ to get to this far, will I manage it in time…? 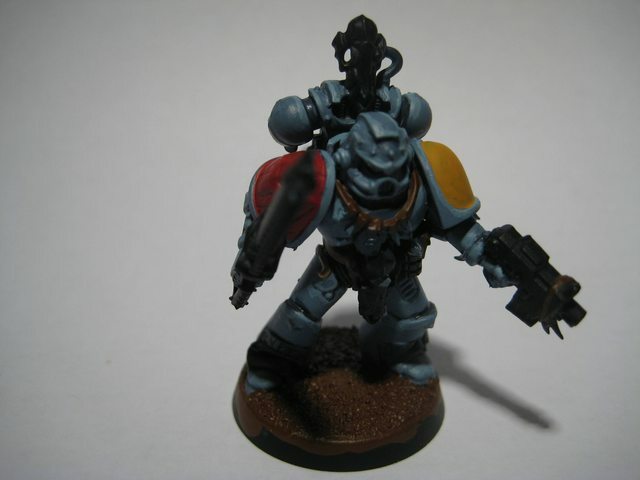 You might find a white undercoat might be better to start from with that grey colour? Your putting the shade on with wash so don’t need to leave much black. Base colours want to be the consistancy of milk, they have good pigment levels so should cover well. You’ll find the highlights better to apply if they are very thin. you can layer the same colour several times to get a stronger highlight with a gradual fade. Cheers! 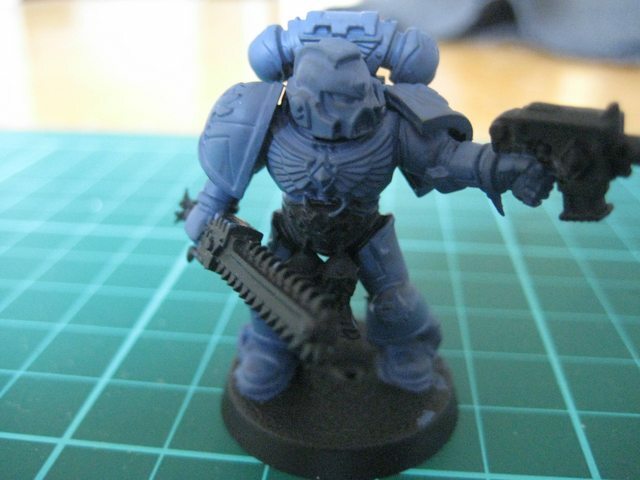 I have a can of white spray paint now so will definitely give that a try, Frank and Shane have also recommmended Halfords Grey primer which I have also bought so will probably do a test on some spare marines to see which produces the best result. 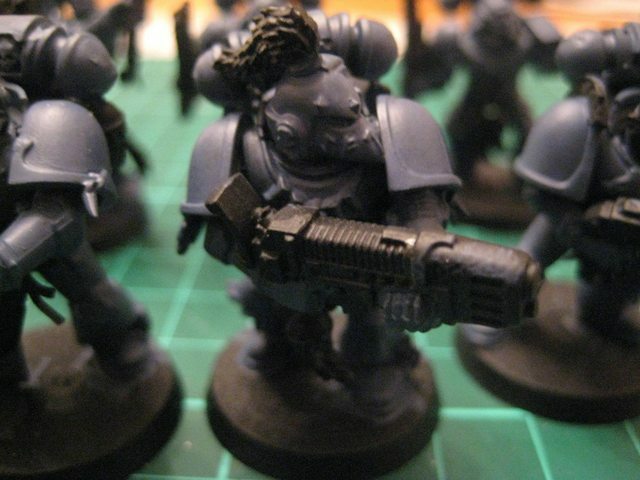 A lot of Space Wolf painting guides also mention the Army Painter Wolf Grey primer, which is a primer and basecoat in one, sounds like it’ll be worth try too to cut down on the layers!